Use the hashtag #my360shop in your social media post and you could go in the draw to win $100 cash every month! 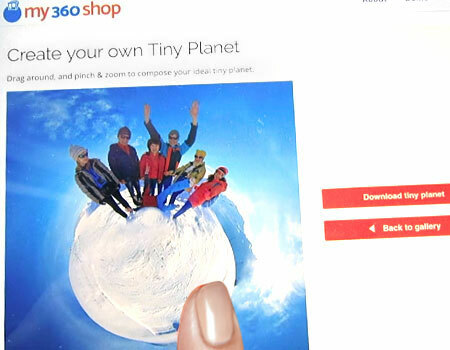 In Instagram, Facebook or Twitter, post one of the 360 photos or galleries you have purchased on My 360 Shop. In your post, credit the photographer either with their social media handle (e.g., @theirhandle) or with their My 360 Shop profile page URL (e.g., my360shop.com/username). post a Tiny Planet created using our Tiny Planet maker to Instagram, Facebook or Twitter. Enter as many times as you like each month. Each post is worth one entry for that month. Old photos from previous posts and months can be re-used. Instructions on how to enter form part of these Terms and Conditions. The Promoter is My 360 Shop, incorporated in Queensland, Australia. This promotion is goverened by the laws of Queensland, Australia. Employees and the immediate family of the Promoter and agencies associated with this promotion are ineligible to enter the competition. Except for the previous condition which is non-negotiable, entries that fail to meet a condition of the competition may be included in the draw at the Promoter's discretion (e.g. the entrant forgets to tag @my360shopcom). All entries must be from a photo that was purchased from My 360 Shop https://my360shop.com/ by you or a friend. The next Entry Period commences on 22 November 2018. Subsequent Entry Periods commence immediately after a draw has taken place. The Entry Period ends two (2) hours before the draw for that period. The next draw will take place at 11:00 am, Saturday on 22 December 2018, AEST (Queensland time). The Winner will be drawn at random from all elligible entries in each entry period and announced at the time of the draw. The Prize is $100 USD which will be paid into the PayPal account of the Winner. Should the Winner not have a PayPal account, or if PayPal does not clear the transaction from My 360 Shop to the Winner's PayPal account, $100 USD will be transferred by International Money Transfer (IMT) to the bank account of the Winner. The currency conversion rate will be as set by the Commonwealth Bank of Australia at the time of the transfer. After being notified by the Promoter that they are the Winner, the Winner must provide sufficient PayPal or bank account details in order for the Prize to be transferred. The Prize will be transferred to the Winner within seven (7) days of the draw. The Promoter accepts no responsibility for the time for funds to be received or available in the Winner's account or for any bank or PayPal fees incurred by the Winner in receiving or withdrawing the funds from their account. Should the Promoter be unable to contact the Winner within seven (7) days or if that potential Winner is not in compliance with these Terms and Conditions, the Prize will be forfeited and, at the Promoter's discretion, another Winner will be drawn at random. The Entrant refers to you, the person, persons or entity entering this competition. By using the hashtag #my360shop, the Entrant permits My 360 Shop to display part or all of the post on our website, at events and in our social media accounts. Additionally, images or posts may be altered before publishing. The Entrant permits the Promoter the right to use the Entrant's name and social media handle for the purpose of announcing the winner and for any related promotional purposes. The Promoter accepts no liability in the event of infringement of the rights of a third party, such as the right to use one’s likeness in the photo(s) posted. Responsibility for any claims by persons involved over rights to use one’s likeness or other such matters are the sole responsibility of the Entrant. In the event of a dispute between a third party and the photo being published, the Entrant shall resolve the dispute by taking responsibility and covering any costs.